The famous Neon Night Marbella is back this October 2017. On Monday, September 25th at 10:00 a.m., it will take place the press conference of the presentation of the fourth edition of Neon Night Marbella. The event will take place in the press room of the town hall of Marbella. 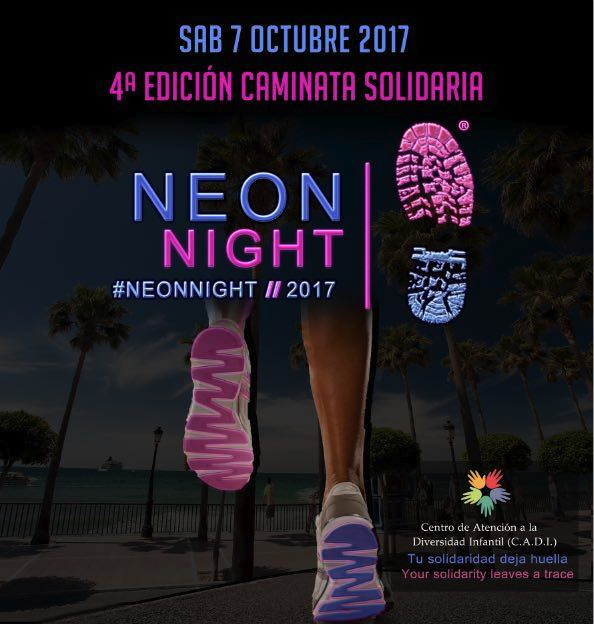 The Neon Night Marbella is set to happen this October 7, 2017, at 19:30. The call will be attended by the delegate of Sports of the City of Marbella, Javier Mérida, the representative of the CADI association, Maite Caño, and the head of the company Eopdebeeck, Elisabeth Op de Beeck. The NEON NIGHT initiative is a solidarity walk celebrated at dusk in which all the members of the family participate. The attendees (neoners) wear fluorescent complements during a chosen route for the purpose of enjoying a special night. Leisure, solidarity, and spectacle are the essential ingredients of this original call whose benefits are intended for social groups in Marbella (CADI) and Malaga (Harena Foundation).